Geraniums (Pelargonium spp.) are among the most traditional annual flowers for the summertime in containers, window boxes and the garden proper. Although a subtropical perennial plant, it is often grown as an annual, or temporary, flower where winters are too cold outdoors. Lots of sunshine and a moist well-draining soil promotes flowers, and promptly removing old flowers--deadheading--hastens reflowering. Monitor the flower clusters on your geranium plant, enjoying them until the majority of the blossoms have turned an off-color or beige. As the petals drop or dry, this is a signal it's time to deadhead. Feel free to pick off blossoms to keep the overall flower head tidy in an effort to delay deadheading. Search for the thin stem holding the waning geranium flower head, and trace this stem down to where it attaches to the main, thicker stem on the plant. Snap off the flower stem from the main plant stem by pushing the flower stem's base downward. Alternatively, snip the flower stem 1/4-inch above the main stem with a hand pruners or scissors. Discard the old flower stem and any dropped leaf or petal debris into the compost bin. No further maintenance is needed to promote new flowers to be made by the geranium. Flowering is heaviest from spring to fall when sunlight is more intense. 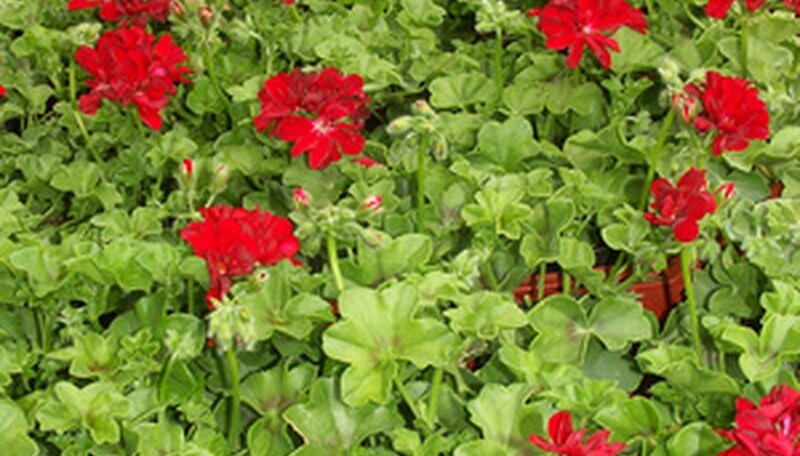 Humid and rainy weather can shorten the life span of geranium flowers, so be prepared to deadhead faded or rotting flowers or leaves more frequently. Be careful not to apply too much pressure or twisting action to the flower stem bases when deadheading, if you do it by hand. You don't want to snap off the growing tip on the main flower branch where new flowers are produced.